Our Story - Manno Clothing & Tailoring Inc. Growing up in Sicily, Leonardo and Lilla Manno’s career choices appeared fairly black and white – learn to be farmers, or learn to be tailors. Thankfully, they chose the latter. 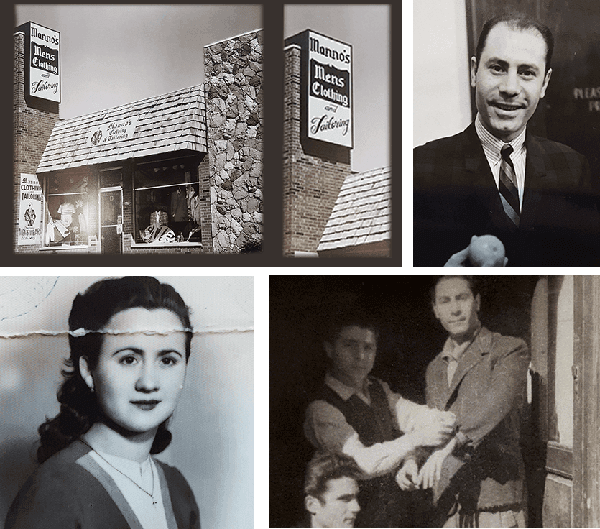 After the couple immigrated to North America, the Manno’s began their career by working as personal tailors in Canada. Eventually, they both found better work across the border in the U.S. working at various department stores. Although the couple earned themselves stellar tailoring reputations, life still didn’t come easy. At times, Leonardo found himself working in the salt mines and tobacco fields of Canada to earn extra income for the family—hard work that would serve him well later on as an entrepreneur. After seven years of personal tailoring for individuals and department stores, Leonardo and Lilla made the decision to open up a store they could call their own. In 1971, the original store started off small, providing full service men’s and women’s tailoring, and a select amount of men’s clothing. Little by little, they started adding garments to the business until demand, and space, required them to move to a larger location. The current store, now owned and operated by second and third generations of the family, works to consistently exceed what is expected. We strive to be servants providing service you can trust, the personalization of old-world tailoring, and the highest quality menswear in the industry. In every aspect, you can depend on our commitment to constantly improving everything we do. Quality isn’t something we do once in a while. It’s who we are. Learn about upcoming sales and new fashion arrivals. Sign up for email notices today.